At the beginning of the 19th century, Bershad became a center of Hasidism. It became celebrated for its tallit weaving industry, which came to an end after many of the weavers emigrated to the United States . The synagogue in Bershad (or, more properly, the “old Beit Hamidrash” or “R' Raphael's Beit Hamidrash”) was built in the early 1800s. It is important to note that, although R' Raphael prayed there, he was not the community rabbi and did not lead the services . A French writer describes his visit to Bershad circa 1999: “One enters the former shtetl on Narodnaya Street, with its Chagallesque houses: crooked windows, undulating roofs, lopsided doors, some windowpaned sections seemingly on stilts, miraculously still standing. In the center of the Jewish neighborhood, at a street corner facing a small plaza, is the synagogue, still in operation today, although there are fewer and fewer Jews, as the Jewish population of the town has been decimated by emigration. 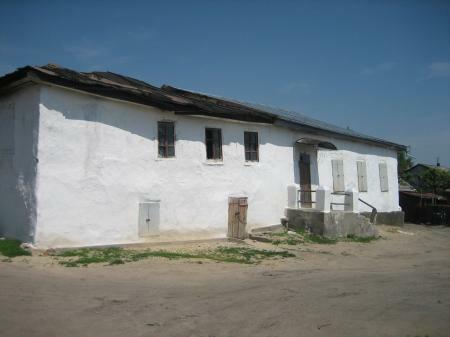 It is a large, fine building, the ancient kloiz of the tzaddik, dating from the 19th century, built of wood and stone, similar in construction to all the houses of the shtetl but wider: the windows are not parallel to the ground but are angled in all directions, the roof does not form a straight horizontal line but a sort of wave. The door opens on a large prayer room, where the inhabitants of the neighborhood flow in at the time of Minchah, in the evening, to gather, listen to Yiddish songs, and eat together. Two Chassidic rabbis from South America have taken the community under their wing in a kind of patronage, aided by a youth from the neighborhood who translates their words into English and Russian. The Yiddish spoken by the inhabitants and by the two rabbis is too rudimentary to permit true exchanges” . “Today, of Bershad's 14,000 inhabitants, 100 are Jews. On Shabbat, 20 of those healthy enough among the remaining community kiss the centuries-old mezuzah on the synagogue doorframe and gather on the creaky benches before the original ark. The problem is that after decades of Communist repressions, no one in the community can read Hebrew or recollect Jewish prayers. The last rabbi left in 1956. One frigid Friday night, an out-of-town visitor occasions a larger crowd than usual. Huddling with them, he teaches ancient Jewish melodies without words—for some, it is the first service they have ever seen. The community and synagogue seem to shed layers of dust and for an instant, their voices rise to the sky. Ironically, it may have been that very same dust which enabled them to hide these many generations. As Yephim says, ‘Perhaps we were humble enough to be spared’” . 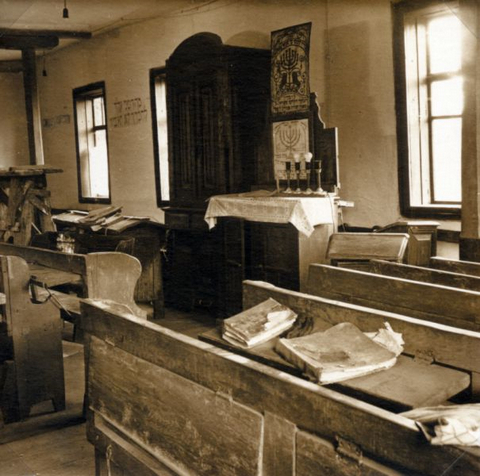 Photographs of the synagogue show a large room filled with ancient wooden pews, chairs, and study tables. Some of the front windows are decorated with lace curtains; in more recent views, they appear to be shuttered. The aron hakodesh [holy ark] is covered by a fringed gold-yellow velvet cloth bearing a Mogen David [six-pointed star]. To the right of the ark is a large wooden piece, probably a cabinet; its vertical section holds two elaborate tapestries or drawings of menorahs; the horizontal surface, covered with a lace cloth, holds a pair of tall candlesticks and a havdalah candle. The round pillars supporting the ceiling are painted white; other pillars, with flattened sides, are light or dark blue. Small blue-and-white Israeli flags are suspended from a rope strung between two of the pillars. On the ceiling is painted a colorful Mogen David within a field of smaller stars. Inside the large star is the inscription: “Mah tovu ohalecha Yaakov” [How goodly are your tents, O Yaakov]. A large chandelier hangs from another part of the ceiling. On the walls are inscriptions saying: “Love your friend as you love yourself” and “Do not do to your neighbor what is hateful to yourself.” In the ezrat nashim [women's gallery], the mouldering pages of prayer books spill from decaying banana boxes. 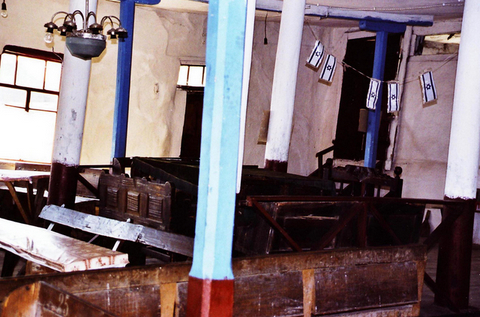 Additional photos of the Bershad synagogue are shown in Part 6.